The Dutch advertisement pop record labels that I have been writing about for the past few days, are not all the labels that tried to fill this wonderful little gap in the music world, of course. There are at least a handful of such labels that I either forget, don’t know yet, or that I have too little records of. The Duet Disco Club is one of these third category labels. I have two Duet Disco Club flexi’s, but I could find only one, and I have no idea how much they released. Duet made nylons in the sixties, that is all I know about the company. The record that is temporarily lost in my Wall of Records doesn’t have a sleeve, but I am pretty sure that all Duet Disco Club records came in the same (one-sided) sleeve. It are one sided black flexi records with two covers of hit songs on them. On the lost record there are two Dutch songs (? ?”Als je boyfriend je toelacht”?? and a song which I cannot rememeber), but I don’t know if all artists are from Holland. I guess not, because the trompet player on my other Duet Disco Club record is called George Scholtz, which doesn’t sound like a Dutch name. George Scholtz palys in an orchestra called The Cosmopolitans, and they do covers of ”Paradiso”? and ”Wann kommt der Tag” . 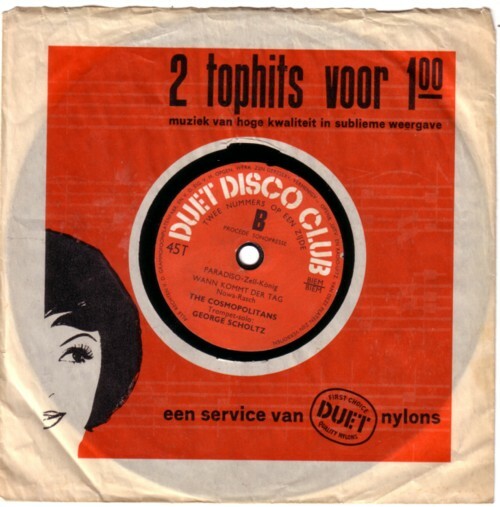 The Duet Disco Club records were sold for 1 guilder. That was cheap, compared to what normal records cost (somewhat around 5 guilders), and the covers are not bad. The flexi’s are made by Sonopresse, of course. I know that are people working on making a complete Sonopresse discography, and I wish them luck. I think it must be over five thousand titles! I will make a list of all the Sonopresse records that I have soon.